Tyn y Fron Holiday Cottage Self-cateringTyn-y-Fron Cottage was originally constructed in the early 1800's as a coach house and artist's studio. Rest assured it is in very good condition having recently been renovated and refurbished in December 07. The cottage sleeps four to five and is available throughout the year, with lettings usually for a minimum of one week. Winter breaks available from late Autumn until March. Owned by Lesley and Tony who are your neighbours and happy to help with information. Lounge - original exposed beams with a high A frame ceiling, stone fireplace, comfortable 3 piece suite and a color TV with a DVD player. There is a small collection of books and board games for you to enjoy. Kitchen - Diner - a beautiful new fully fitted kitchen, washing machine/dryer, dishwasher, electric hob and cooker, fridge freezer and microwave. Bathroom - newly fitted with a full bath with shower over. Bedrooms - two bedrooms, one double the other a large room with twin beds with plenty of room for a studio bed or cot, all beds have electric blankets for your added comfort. Services - heating is by metered electricity with full electric central heating, no coins required. Bed linen and towels are provided and are included in the price, beds will be made up ready for when you arrive. 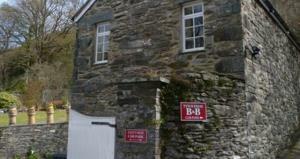 Tyn-y-Fron Cottage was originally constructed in the early 1800's as a coach house and artist's studio. Rest assured it is in very good condition having recently been renovated and refurbished in December 07. WiFi internet access - lap top required. From A5 take A470, turn up Lon Muriau and we are the only property on the left of the lane.